On a luxury cruise in New York Harbor, notorious criminal Vitor Sousa (Sao Paola’s most powerful crimelord) is ready for a long vacation. Suddenly, Fishface comes crashing through a window, ready to get revenge on Vitor (whom he knew in his Xever days). 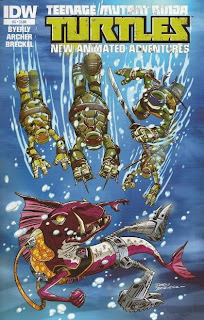 Meanwhile, in the Turtle Sub, the TMNT are following up on a tip April received on her website about Fishface attacking the cruise. They board the ship and follow the trail of screams to the engine room. They rescue Vitor in the nick of time and lay a pounding on Fishface. In the chaos, a live wire hits a ruptured fuel tank and there’s a huge explosion. As the ship takes on water, the Captain orders all the passengers and crew to board the lifeboats. In the confusion, the Turtles make an escape with Vitor. As they make their way up, they ask why Fishface would want to kill him. Vitor explains that he and Xever used to be a criminal duo in their younger days but had a falling out. Xever had no ambitions beyond being a hired thug while Vitor desired to be a “legitimate businessman”. Fishface bursts out of the knee-deep water and calls Vitor out on his lie. He reveals that it was Vitor who sold him out when he was pulling the Oroku Saki job and got him sent to prison. 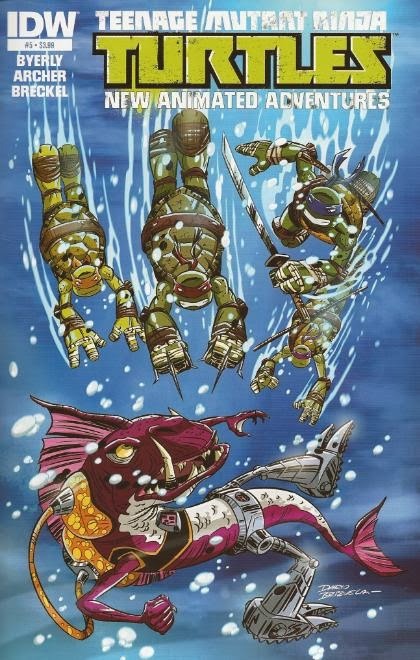 Because of Vitor, he joined the Foot Clan, and because of his association with the Foot Clan, he met the Turtles, and because of the Turtles, he was mutated into a freak. Due to this poorly strung together logic, Fishface blames Vitor for his predicament and wants revenge. Suddenly, the cruise ship turns over on its side. Vitor uses the opportunity to escape, as do the Turtles (who find they’re no match for Fishface in the water). A few moments later, they hear Vitor crying for help. Leo wants to rescue him, but Raph insists there’s no point in saving a badguy who is just as likely to doublecross them. Leo expresses that they aren’t just Teenage Mutant Ninja Turtles, they’re also Teenage Mutant HERO Turtles and that means they can’t be picky about who they rescue. 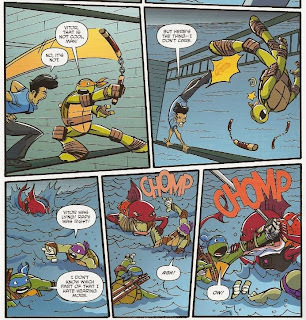 Leo, Don and Mike rush to help Vitor, but Raph chooses to go back to the Turtle Sub. The Turtles find Vitor on the deck, clinging to the poles of a crow’s nest. They climb out to help him and Vitor uses this opportunity to attack them. He believes that if he takes out the Turtles, Fishface might leave him alone. Fishface then shows up and says he’ll consider it (though not really). They team up and as Vitor pounds on Mikey, Fishface incapacitates Leo and Don with his venomous bite. 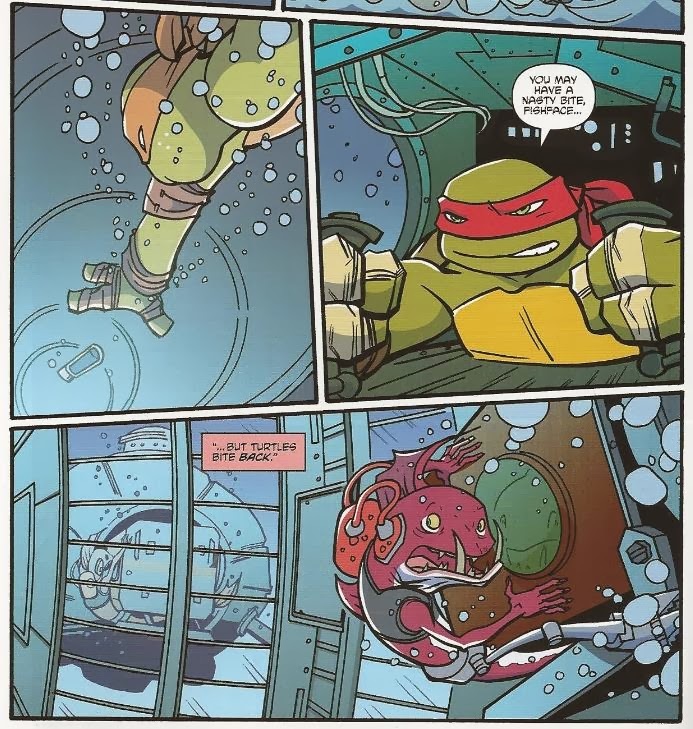 Things look bleak until Raph arrives in the Turtle Sub, taking Fishface by surprise. He snatches Fishface in the jaws of the Sub and drags him underwater. Having endured enough madness, Vitor swims to the lifeboats and escapes. Mike attempts to inoculate his brothers with the Fishface anti-venom, but drops it and has to swim for it as the cruise ship now completely submerges. 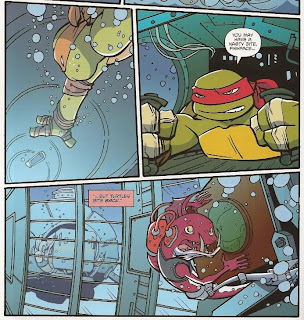 Underwater, Raph slams Fishface into the bridge of the ship, trapping him in wreckage. The cruise ship then takes Fishface all the way to the bottom of the ocean. Mike, meanwhile, nabs the anti-venom and administers it to his brothers as Raph comes to collect them in the Sub. Later, back at the lair, Raph is all set to give Leo a huge “I told you so”. Just then, April walks in and says that the tip Leo told her to phone-in to the cops worked like a charm: Vitor was promptly arrested as soon as the lifeboats docked. Leo tells Raph that just because they have to save the badguys, that doesn’t mean they can’t bust them, too. 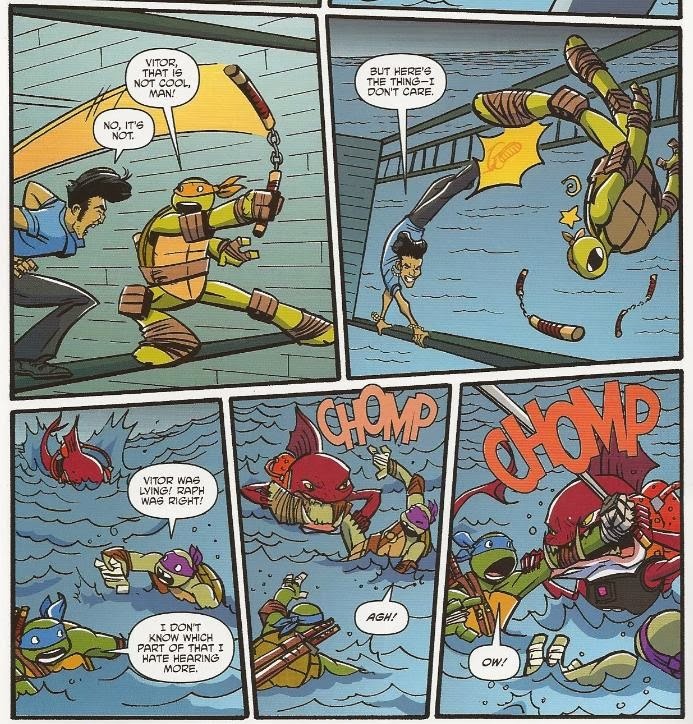 *This story is continued from TMNT New Animated Adventures #4. The story continues in TMNT New Animated Adventures #6. *The Turtle Sub first appeared in the episode “Karai’s Vendetta”. *Fishface’s history was elaborated upon in the episode “Baxter’s Gambit”. *Heh heh. “Teenage Mutant Hero Turtles”. You Europeans must be in stitches, right now (if, um, you got this comic distributed on your continent… which you don’t). *CHET ALERT: The fat cruise attendant Vitor elbows in the face on page 3 has a nametag reading “Chet”. 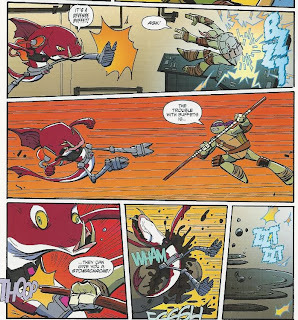 “Chet” is an Easter Egg thrown into numerous TMNT comics because… It just is! *This issue was originally published with 2 variant covers: Regular Cover by Dario Brizuela and Cover RI by “Mr. Charlie”. Of all of Byerly’s issues of New Animated Adventures, this one read the fastest to me. It really doesn’t waste any time with the setup, practically starting in medias res, and jumps straight into the action. It’s swiftly paced, but that isn’t necessarily a knock against it, either. Sometimes it’s nice to have a story where the action moves so fluidly you wonder where the time went. This one is a focus on Fishface, though it doesn’t really offer any insights into his character. There’s a reference to his backstory from the cartoon, but the connection with Vitor doesn’t add any new layers to the villain, it just gives him a tenuous excuse for revenge. It’s a bit like the spotlight Dogpound received in the previous issue in that it highlights him as a villain, but doesn’t tell us anything about him that we don’t already know. Not all comics can be deeply introspective, I’ll concede. The lesson Byerly imparts with this issue isn’t perhaps his smoothest or subtlest (the characters have a page-long conversation in the middle of the issue, debating the pros and cons of this message). That aside, I did get a fanboy giggle out of the “Ninja Turtles” vs. “Hero Turtles” argument and Mikey’s constant badgering about what an awful name the latter is. Even if you aren’t familiar with the Easter Egg, Byerly actually works the reference in rather intuitively, as Leo is the one who suggests the title as he goes into cornball “Space Heroes” mode. It was fitting and didn’t stick out as obvious fanwank, I don’t think. And for the first time in New Animated Adventures, we have a different artist! It looks like we’re going to be getting a few fill-in artists to offer Brizuela some relief in the upcoming months and I’m cool with that. It’s refreshing to get a visual changeup every now and then. Adam Archer has produced a couple of variant covers for the series so far, but this is his first full issue. While his layouts aren’t the most elaborate, he provides some solid pencils with a more exaggerated style than Brizuela’s. The characters are a bit cartoonier when they emote (Fishface in particular) and there are some triumphant moments of kinetic energy (Fishface getting slammed into the bridge of the ship on pages 20-21). When characters drift to the background they lose detail, and while that’s perfectly understandable, there are moments when it looks just a little too crude (page 10, panel 2 almost hilariously so). Be that as it may, it’s still a good-looking issue and a nice change of pace. This issue had a weaker conflict than the past couple of issues and probably isn’t the comic’s strongest showing, but it’s not bad by any means. Anybody enjoying the series so far is going to dig this issue, too, and that’s just fine. Speaking of IDW, did you ever review the 2 panel Fred Hembeck comic from the IDWords column? It would have been around TMNT #7. I was reading a friend's Star Trek #6 and came across it just now. Apparently Dario is lending his talents to the new Scooby-Doo-Batman&Robin team up book this month! I guess that's somewhat historic, but let's hope it doesn't distract him too much from his future Turtles contributions! "Heh heh. “Teenage Mutant Hero Turtles”. You Europeans must be in stitches, right now (if, um, you got this comic distributed on your continent… which you don’t)." As a matter of fact, we do, courtesy of the Internet and several well-stocked comic shops. But I think this pun is something the European distributors of the Fred Wolf cartoon series so richly deserve.